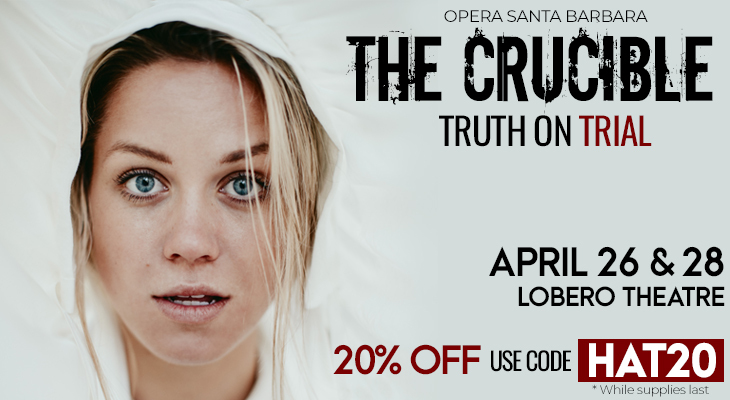 Opera Santa Barbara closes its 25th Anniversary Season with an OSB premiere of Robert Ward’s Pulitzer Prize-winning opera, The Crucible, 7:30 p.m. Friday, April 26 and 2:30 p.m. Sunday, April 28, at the Lobero Theatre. General and Artistic Director Kostis Protopapas to conduct and Stephanie Havey to direct. Ranging in price from $49-$129, tickets can be purchased online at loberotheatre.org or by calling 805-963-0761. Winner of the 2013 Opera America Director-Designer Showcase, director Stephanie Havey is a sought after collaborator for the development of new opera. She directed Double Exposure for Opera Philadelphia and participated in Opera America’s New Works Forum and the North American New Opera Workshop. The Crucible features a large cast led by bass-baritone Wayne Tigges and mezzo-soprano Audrey Babcock making their Opera SB debuts as John and Elizabeth Proctor, the central couple on trial in Crucible’s Salem. Tigges, a rising star in opera with appearances including the Metropolitan Opera, San Francisco Opera, and Paris Opera, recently sang the title role in The Flying Dutchman, Basilio in The Barber of Seville, and Sgt. Aaron Marcum in An American Soldier. Babcock returns to the Lobero stage after recently appearing in OSB’s 25th Anniversary Gala Concert. Babcock is widely recognized for her commanding performances in classic and modern works and has earned praise for her portrayal of Carmen with companies across the country. She has premiered operas including Tobias Picker’s Thérèse Raquin (Dicapo Opera), and With Blood, With Ink (Fort Worth Opera). Returning to the Santa Barbara stage are hometown favorite Nina Yoshida Nelsen as Tituba (2014 - The Consul, 2012 - Madama Butterfly) and OSB Studio Artist Alumnus Colin Ramsey (2017 - Manon) as Reverend John Hale. Soprano Anya Matanovic (Abigail Williams) and tenor Corey Bix (Judge Danforth) also sing major roles in the opera. Robert Ward composed the English language opera based on Arthur Miller’s play, The Crucible. It won the 1962 Pulitzer Prize for Music and was originally commissioned by the New York City Opera. Miller was involved in selecting Ward to adapt the play for an opera. The Crucible is a classic American drama written as an allegory for McCarthyism and the US Government’s persecution of suspected communists. Miller himself had been questioned by the House of Representatives’ Committee on Un-American Activities. It is a story of a community confronting mass hysteria and dangerous ideology and the repercussions and costs of reputation and integrity. Its relevance continues to awe audiences in an age of shifting truths. Opera Santa Barbara has added a third performance for middle and high-school age students on Monday, April 29. More than 500 students are attending this free performance, underwritten in part by Montecito Bank & Trust.